During the summer of 1976, Steve Jobs and Steve Wozniak created and sold 175 Apple-1 computers, marking the launch of what is now one of the most valuable, influential companies in the world. Only 60 or so of those original machines are still in existence, fetching hundreds of thousands of dollars at auction. This Monday, auction site CharityBuzz is set to auction off one of the rarest Apple-1 computers, which could fetch up to a million dollars. Dubbed the "Celebration" Apple-1 by computer historian Corey Cohen, the machine CharityBuzz will sell features a blank "green" PCB board that was never sold to the public and was not part of a known production run. 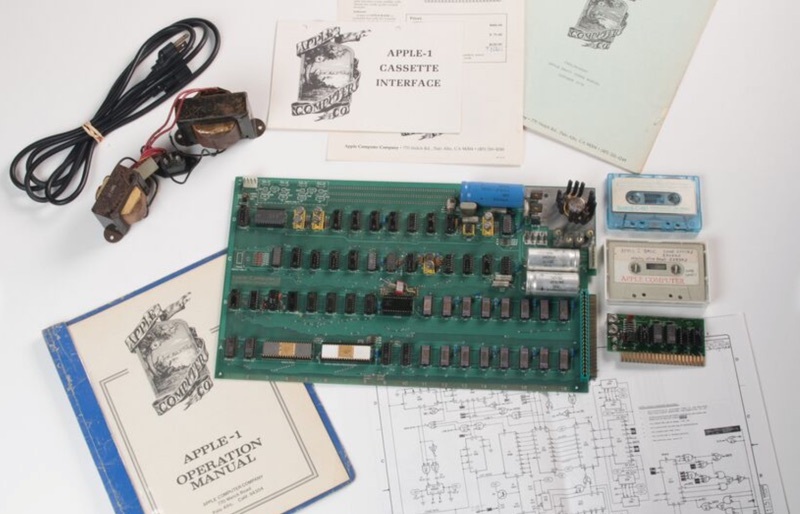 CharityBuzz describes it as an original Apple-1 ACI cassette board, pre-NTI, with Robinson Nugent sockets, a period correct power supply, and an early Apple-1 BASIC cassette labeled and authenticated by original Apple employee Daniel Kottke. It also comes with original Apple-1 manuals, original marketing materials, and Apple-1 and Apple-1 ACI Cassette Board schematics, described as the "most complete documentation set" of all known Apple-1 boards. According to Steve Wozniak, Co-Founder of Apple, "Only a few Apple I's, on blank (not green) PC boards, may have been manually soldered, although I'm not sure of it. We arranged the wave soldering with the company that made the PC boards. But we may not have wanted to wave solder a run (of maybe 10 or more board) until we manually soldered one or two to debug them." The Apple-1 is not in working condition but could be restored to full functionality with minor tweaks, something Cohen recommends against in order to preserve the board's uniqueness. 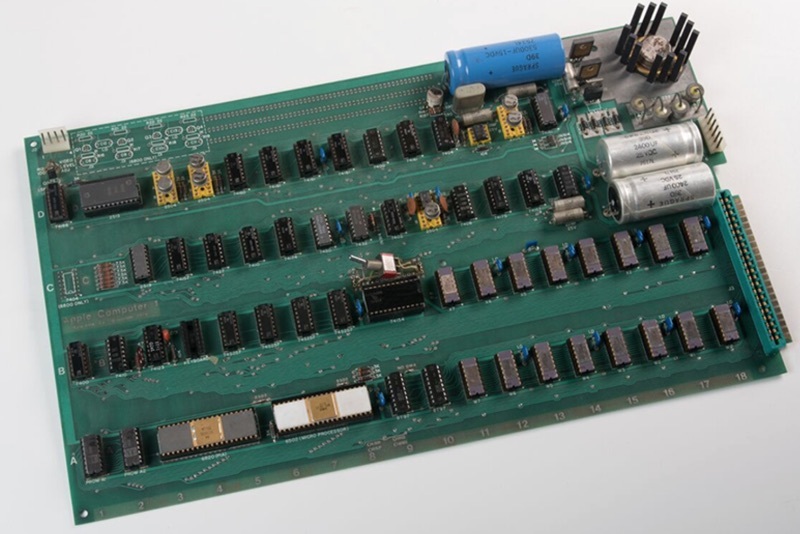 "The Apple-1 board is a not just a piece of history, but a piece of art," he says. CharityBuzz's auction will kick off this Monday, July 25, and will last through August 25. 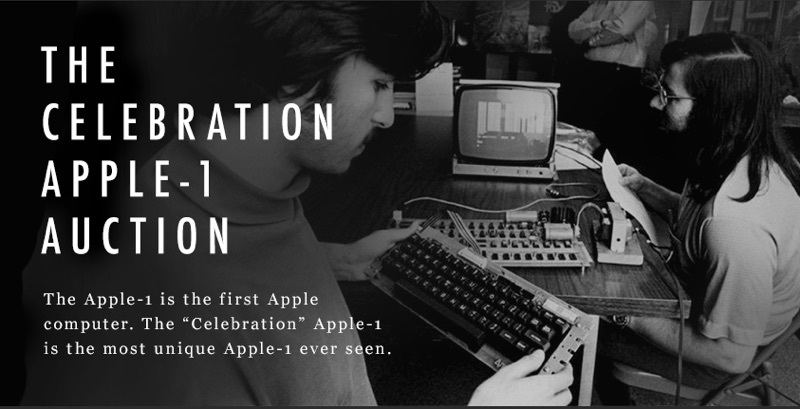 Interested bidders or those who want to follow the auction can check out the auction landing page, which features a countdown to kickoff and full details on the Celebration Apple-1. The Celebration Apple-1 will be on display at the Vintage Computer Festival West, set to take place on August 6 and 7 at the Computer History Museum in Mountain View, California. CharityBuzz believes the Apple-1 could fetch up to $1 million, which would be one of the highest prices an Apple-1 has sold for at auction. Ten percent of proceeds from the auction will be donated to the Leukemia and Lymphoma Society. So taking the necessary steps to make this board functional actually reduces it's value? Yeesh. Sometimes it's better not to try to "fix" or "improve" something just because it's old. Remember this one? Today's Macs haven't been updated for so long, they could almost be included with this auction as vintage pieces. I'm waiting for the iFixit tear down before I place my bid. For $1M+, that thing had better be end-user repairable! Hmm, more overpriced and underpowered Apple hardware. If MacRumors had a limited-issue 1987 newspaper publication, you just know the opinions section would be full of people complaining that you can't solder new capacitors into the latest Macs. It doesn't have a headphone jack! Could this be the iPhone 7 chipset? Only 10% goes to charity? WOW Where does the rest go? You guys are being mislead. This is actually the new Mac Pro with a new high end innovative design and some astonishing specs according to Tim.